So I have to give major props for my hubby for Valentine's Day. so he's never really surprised me before. Yesterday - he surprised me. I came home from work & I'm the first one home. I walked in & noticed the house alarm was off. 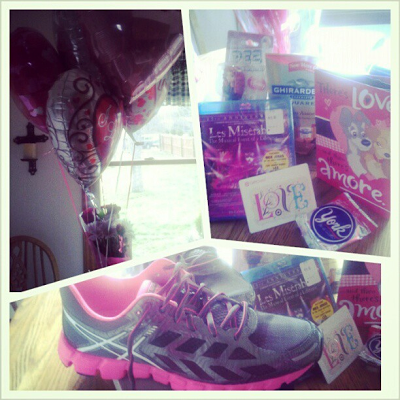 I stood in the middle of the kitchen thinking, "I KNOW I turned it on when I left"
Then Ricky popped around the corner yelling "Happy Valentine's Day"
Funny how I didn't see the massive amount of balloons - only running shoes! haha!!! Now that's a pretty awesome husband - I gotta say! Anyone else a tad freaked out about this Asteroid coming close to earth today? & then I turn on the TV this morning & see a meteoroid hit Russia? HELLO!!! See the video of it? & that's how far its going to be? Find me in Heaven & give me a shout out that I called it - OK? but anyone else think that crazy cop in California isnt really dead? so how do we know its his body that they found in that cabin? Its been a nose bleed kinda week for me. Its funny because I thought about it running last night & thought why did I get so emotional? Dance Moms: I love how Abby & Kathy can get random kids that already know how to dance & they put them in a competition & they're like "That's from MY company"... how does that make sense? The Bachelor: Thank you Jesus that Sean has a sister that knocked sense back into her brother about girls that don't get along with other girls. Tierra is OUTTA there... & did you see? She's already engaged to someone. Good luck to that man. Glee: Are you kidding me? Mr. Shue & Miss Pillsbury STILL didn't get married? Stupid. Probably more stupid then me still watching Glee. But Sue showing up in the same wedding dress did make me laugh. Hope you all have a Fantastic Friday!!!!!!! Ricky rocks! You are blessed! That video was so sweet. Thanks for sharing that! Wow! your hubby really went all out for Valentines Day. That is awesome. I thought the same as you. That's probably not the cop that's dead. Who knows! Let's see if he pops back up some place killing people again. Its 50/50 if the asteroid hits us. That's the odds for anything ever happening. Either it will or it won't! Glee really bugged me last night...I think the part with everyone heading to a hotel room just irked me. oh my gosh, I love your frags!!! you girl, make me LOL!!! The small tupperware container thing is way funny - - - though I'm kinda surprised they even knew the word TUPPERWARE, seeing as the cheaper "over the counter stuff" has pretty much taken its place - - - though perhaps we CALL that tupperware even though it isn't. WOW!!! Ricky blew it out the water!! I mean seriously!! I watched my man clean house, while I vegged on the couch. So kind of him. He just doesn't have to, and he helps me a lot. So sweet!! Nose bleeds? What is causing them? That sounds awful. That last picture cracks.me.up. Hahaha..... so funny. I.am.old. Wow. Great surprise by the love of your life. I hope you remember this V-day for years to come. Okay, Ricky is blowing my mind. I'm still not over him sneaking out of your house at dark thirty to get you a gift on your birthday and then writing in the snow. Very very sweet. That video was just too sweet. So glad Tiera is GONE. What a whack-job!